I am good at biting the dirt, or the gravel, the mud, the snow, the rocks, the roots. Making unintended contact with the ground is something I do well because I have worked with horses all my life. When I was younger, I rode green horses, or horses with issues serious enough to make their owners want to pay someone other than themselves to get on their backs. I still ride green horses, but am acutely aware of the finite nature of life at age 45. I don’t bounce like I used to, and because of that I’m a lot more careful than I once was. 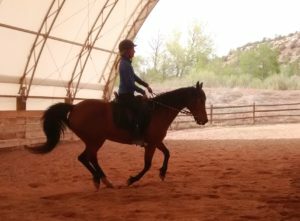 I fall off horses less often, but still get a lot of practice falling because I now run trails in addition to riding. I’ve been a clumsy human all my life. To no one’s surprise, I am a now a clumsy runner, which means I don’t even need a horse any more to experience the humbling sensation of finding myself face down on the dirt. Falling off a horse feels a lot like falling while running. Both are sudden, both hurt. Common sense says that falling off a horse hurts more because it’s from a higher starting point. The average horse stands 15 to 17 hands tall at the withers, which translates into an additional five to six feet of height. The human body is subject to the laws of gravity, which say that what goes up must come crashing down, and that the force of impact is greater when the object falls for a longer distance. My various body parts have tested that hypothesis a lot over the years, and can vouch for its correctness. But that’s not the whole story. Sometimes, falling without a horse hurts more because you don’t spend enough time in the air to tuck and roll. Also, the horse usually gives you fair warning in the form of pinned ears and a few preliminary bucks. You can plan an exit strategy. 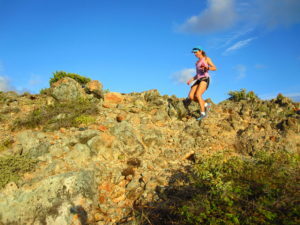 When you fall on a trail run, it’s usually a surprise. There is no time to scout out the best spot for landing, and there is no time to curl into a ball beforehand. If you are lucky enough to ride in an arena, chances are you will fall into good footing, meaning sand, sometimes mixed with bits of rubber made from (I am not kidding) old running shoes. Riding arenas are designed for minimizing impact on sensitive horse joints and tendons. They also minimize the impact on riders’ bodies that get dumped into them, a useful side effect and one more reason to invest in good footing. 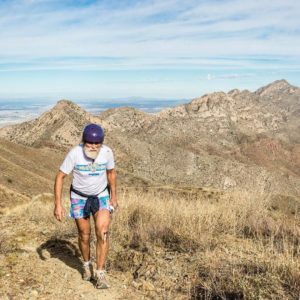 On the other hand, trails of the type that appeals to ultra runners tend to be rocky, rooty, muddy, or all of the above at the same time. 1. Focus on the terrain in front of you. Do not gaze at the scenery or at the arm sleeve tattoo on the runner just ahead. Do not fiddle with your pack, do not try to tear open a pack of almond butter, do not check your GPS watch to see how fast you’re going. I have done all of the above, with disastrous results. 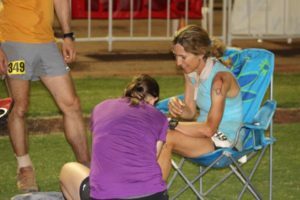 Last year, right after trying to rescue my cell phone during a particularly nasty fall on a rock hiding under a layer of slushy snow, I bruised my ribs at mile 20 of the Grand Canyon 100, which ended my race. 2. Run your own race. Don’t get competitive when someone passes you. The people who negotiate rocky terrain at breakneck speed are genetic freaks, related to mountain goats. Or maybe they will crash around the next switchback. Either way, do not use the technical, steep downhill to catch up to someone else. Trust me. Your knees will thank you. 3. In the words of my wise friend and mentor Randi Young: PYUFD, short for pick up your feet, dummy. This should be your mantra. So simple, yet so often ignored. 4. 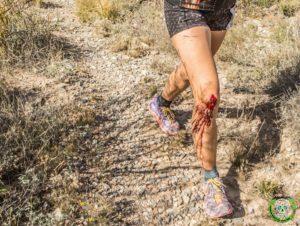 Most of us clumsy runners have two distinctive gears: the careful one reserved for gnarly sections, and autopilot, which is the shuffle reserved for smooth surfaces. This is dangerous because one tiny pebble can flatten you on an otherwise obstacle-free trail, or even road. These embarrassing crashes might injure your knees, but they injure your pride even more. Are both arms still in their sockets? Both legs still attached and able to bend and straighten? All teeth present? 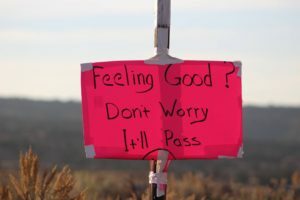 If so, pick yourself up, and get back on the horse, or in this case the trail. Run if you can, walk or limp if you can’t. It’s almost always better to keep moving than to wait. The pain will subside more quickly. Many times, it goes away altogether. The blood will mix with the dirt, then dry, which is better than a band-aid. Bruises have less of a chance to settle in. The same is true for mental effects, like post-fall PTSD. So get up, dust yourself off, and wear your bloody bits proudly. You are now a trail runner. This entry was posted in Uncategorized on May 27, 2016 by silvakat. A good read, enjoyed the analogy, between running and riding horses. Like I know about being rocket launched from the horse’s back. 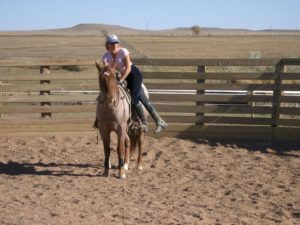 I am getting more cautious in my age, not riding “young and dumb” horses. But sometimes even the older solid horses can get you. It is not safe out there, but hey, playing it safe all the time can be boring. Exactly. Some risks are worth taking. Great read! I have only recently started to experience the joys of trail falling. Good advice about not getting caught up trying to catch the super human freaks. I’ve actually managed to fall on roads (well, sidewalks) before. Generally in front of people. That takes a particular kind of skill. Yep, I’ve done that, too . . . Getting back up and reassuring people walking by that Im ok and do this sort of thing all the time takes even more skill! Great post, Katrin. You nailed it again! 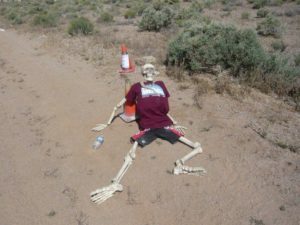 PYFUD Trail Runners unite! Great article. 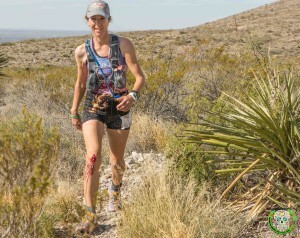 Switched to trail running last year and am grateful for my youth as a gymnast which allowed me to “save myself” a couple times as The ground was approaching my face. I’ve never felt clumsier since being out on the trails. PUYFD is perfect. Thanks. I can’t imagine a gymnast ever looking clumsy, but I know what you mean. My sense of balance, fine-tuned from years of riding, has saved me many timee. Usually, I get into trouble during races, when my competitive instinct overrides common sense.